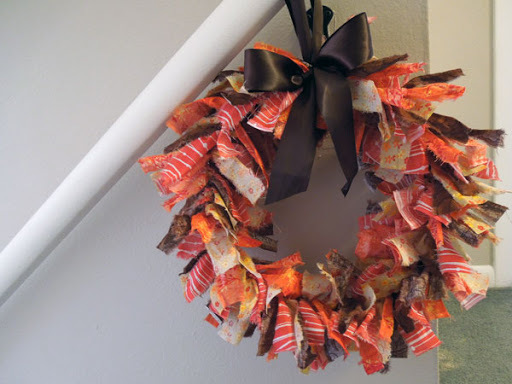 I’ve been looking for inexpensive ways to decorate our home for the seasons, particularly fall, whose color palette I really enjoy… so I’d been shopping around and finding a ton of things that I liked that came at a pretty steep cost (can’t really afford a $40 wreath, you know?). I purchased $5 worth of fabric quarters (they were on sale for $1.25/ea. at Joann’s) in 4 colors and spent a bit of my afternoon cutting (and tearing, because ripping fabric is quite a bit of fun) the quarters into 1×7-inch strips. I just followed the tutorial and tied them one at a time, right next to each other (in a repeating order because I don’t do “random” so well). This was one of the easiest projects I’ve done in a while, though it did require a bit of prep work. I made a few of these and gave them away as birthday presents to some friends (I kept one for myself, don’t worry!). I grabbed a bunch of fall-colored felt at Hobby Lobby (reds, yellows, oranges, greens, browns) and some craft yarn. The leaves I just cut out free-form, some multiple sheets at a time. I used about 40 leaves per garland because they were 2-3 inches in length and that was what I was going for in length. Mixed them all together in a paper bag and pulled them out at random (though I did have rules for how close leaves of the same color could be). You can make them however long, but it does get tiring after a while of continuing to push the ones at the bottom further down the yarn. Tied each off at the end. My house looks a little more festive for the season, and I’m pretty excited about it all. I like the fall. The leaves are turning and the air is much cooler than it was over the summer. And, to beat it all, I didn’t spend $40 on a wreath. « Media Monday: "The Shallows"
If you are feeling like trying something new…get some wax, melt, and dip leaves in it. Lay them on wax paper to dry then hang. They will last 3 months or so and look great. So cool! I have a sad little undecorated wreath by my front door but my imagination fails me as to what to do with it.